April is flushed with cultural activities in the U.S! Did you know that libraries and library workers in the U.S. are honored in April?National Library Week is April 7 – 13, and this year’s theme is Strong Communities. Our BNCs show various types of support for the work of libraries, ranging from dedicated flexible spaces for a host of activities to shelves for browsing and EducationUSA collections. Libraries represent core values of democracy, such as my favorite librarianship value—intellectual freedom. Historically, the U.S. Government has been celebrating Jazz Appreciation Month overseas for years. For 2019, the Smithsonian’s National Museum of American History has posters and ideas for teachers on jazz appreciation with UNESCO capping off the month with International Jazz Day, a live concert you can stream at your BNCs all the way from Australia. Earth Day on April 22 is surely a day that all of our BNCs will celebrate with positive actions. As you round out the month of April, don’t forget it’s also National Poetry Month. You can recognize poetry at your BNCs with a poetry slam, memorizing a poem, and writing poetry. Mrs.María Prado, USA Ambassador´s wife, visited AMICANA in March. During her stay, she received a tour of the recently remodeled institution, spoke with Access students about what the program means for them and their motivations to learn the English language, and visited the class where the leadership program on “Exploring Computer Science” is held. Before heading back to Buenos Aires, Mrs. Prado met the President of the Board of Directors and other members of AMICANA’s team. 1. The new Teacher’s Corner Article is up on the website! This month’s topic is on MOOC camps and facilitation, written by EL Fellow/Specialist Alum Jimalee Sowell. A discussion group is happening all month on the AE Teacher’s Corner Book Club page on Facebook. 2. This week on the American English at State Facebook Page, we are posting nature vocabulary graphics in celebration of Earth Day, which is coming up on April 22nd. We are also posting graphics teaching useful vocabulary for the TOEFL and other standardized language assessments. 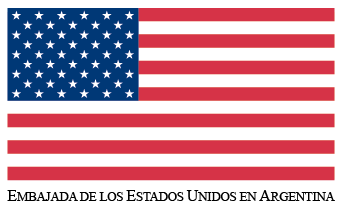 Every Thursday, we post a vocabulary graphic about studying in the United States to cross-promote Education USA. This week’s graphic is “Placement Test.3. This week on the American English for Educators Facebook Page, we are sharing Teaching Tips from FORUM, classroom management techniques, and featuring resources from americanenglish.state.gov. For more information, please contact Dr. Susana Tuero, ARTESOL President (sbtuero@gmail.com) & Please let Noris Zerdá know who is attending from your Center. SALTA. 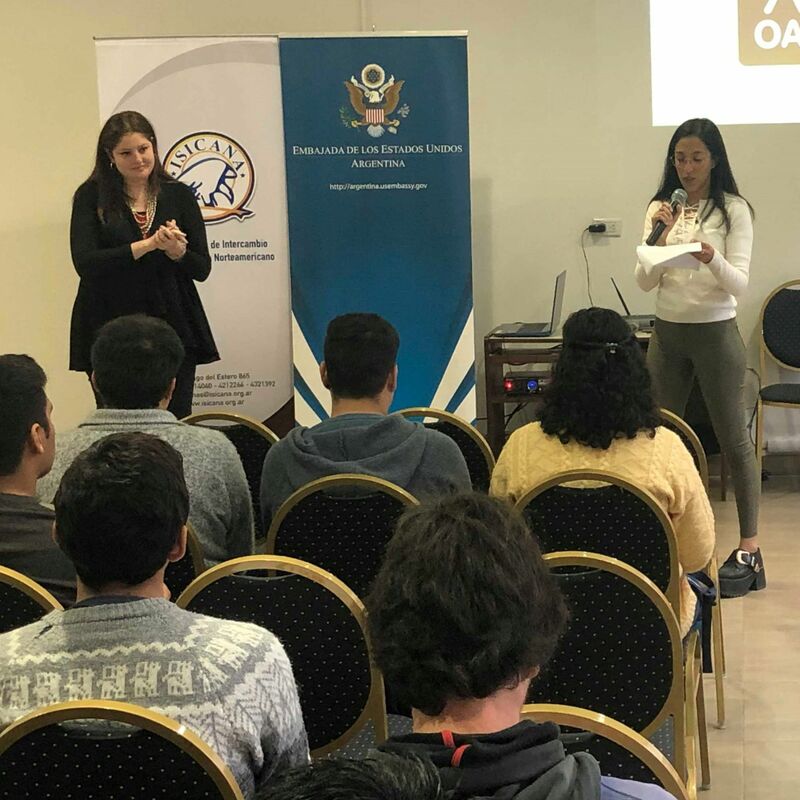 The U.S. Embassy in Argentina, in collaboration with ISICANA and two local NGOs –OAJNU and JCI- sponsored an event on leadership and community engagement (“Liderazgo y Participación Ciudadana”) held on March 28 at the Forum Salta saloon. The program consisted of two different workshops attended by 40 people covering these two topics. Former English Access students from ISICANAAna Martina Braslavsky and Rosario Medina presided the Leadership workshop. This event aimed at providing the community with different project planning tools and developing leadership skills. ARGENTINA’S BNCs: What are they up to? USHICANA: In December 2018, a group of students from Ushicana took part in an internship program at the Secretary of Tourism. Last month they received their certificates in a ceremony presided by Walter Vuoto, Ushuaia’s major, together with Jose Luis Recchia, Secretary of Tourism and Undersecretary Rodrigo Arrieta. ClickHERE to learn more about this event. is carrying out English clubs for its students as well as non-students, an innovative way of learning English. These clubs are held by a U.S. native teacher with a Master Degree in Arts, who favors participants’ learning and fosters their communicative skills.ISI Clubs 2018 achieved great success. Participants enjoyed cooking, photography, reading and producing creative artworks in and outside the Binational Center, finalizing the year with a closing display of their work. ISI Clubs 2019 are coming back with new additions such as drama and English conversation sessions. AMICANA successfully developed its Summer Science Camp with 35 kids ranging ages from 8 to 14 years old. In 4-hour-long daily meetings held for a fortnight, students learned about STEM, hydraulics, physics, electronics, robotics and programming. 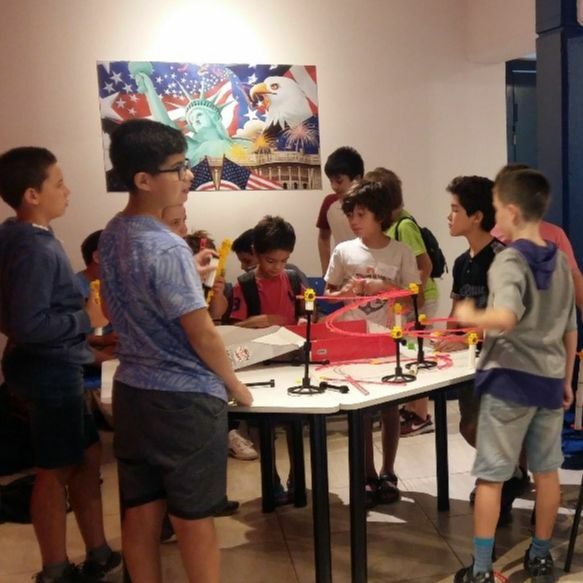 They engaged in fun experiments such as building a hydraulic arm with paperboard and syringes, testing a non-Newtonian fluid and creating robots to compete in a sumo fight! 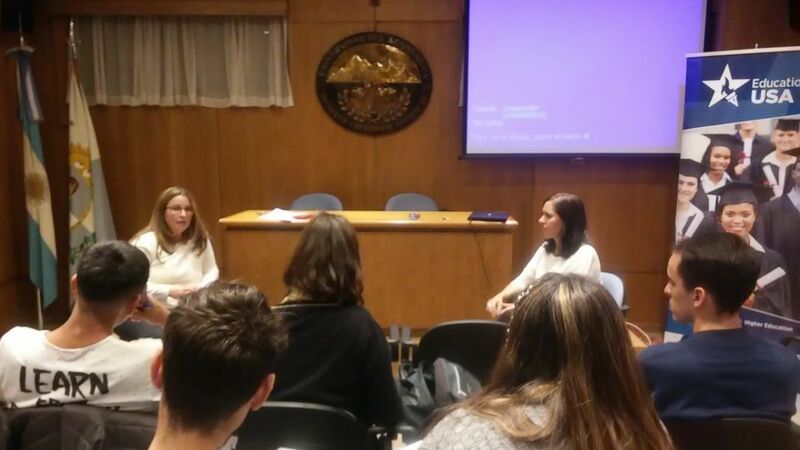 EducationUSA: On March 26th, the BNC’s EducationUSA Adviser María Iglesias carried out an outreach program at Universidad del Aconcagua. 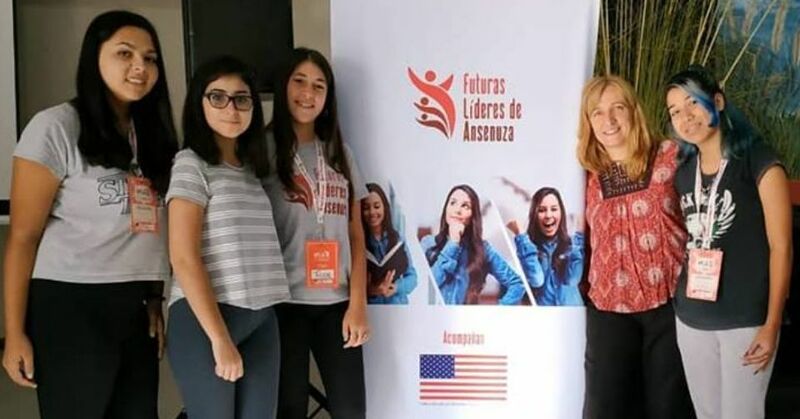 She gave a presentation on EducationUSA and opportunities for exchange programs and scholarships for 10 students and teachers at Escuela Superior de Lenguas Extranjeras, Universidad del Aconcagua. The presentation was part of a series of information sessions held at different universities in relation to student mobility programs. 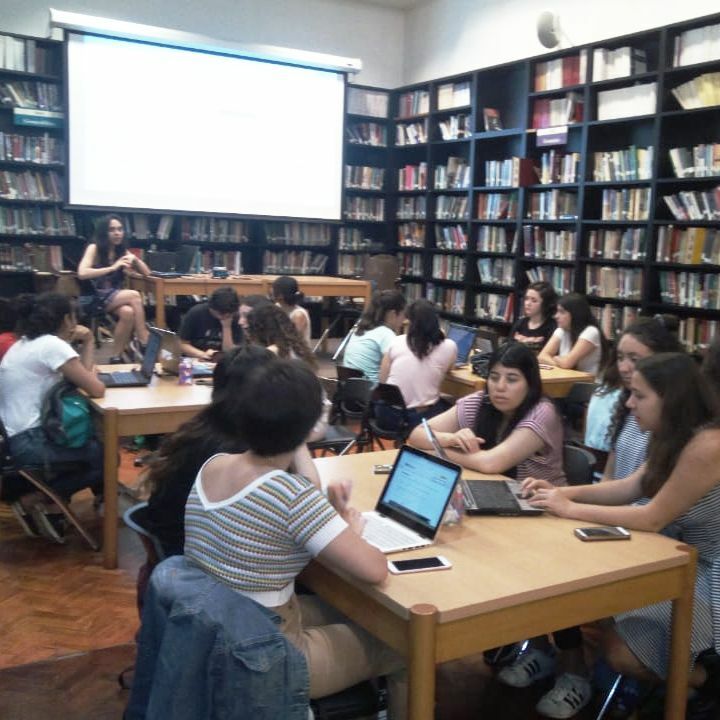 Chicas Programadoras: After a very successful summer program, ICANA is launching a new edition of Clubes de Chicas Programadoras at its Centro and Belgrano sites. 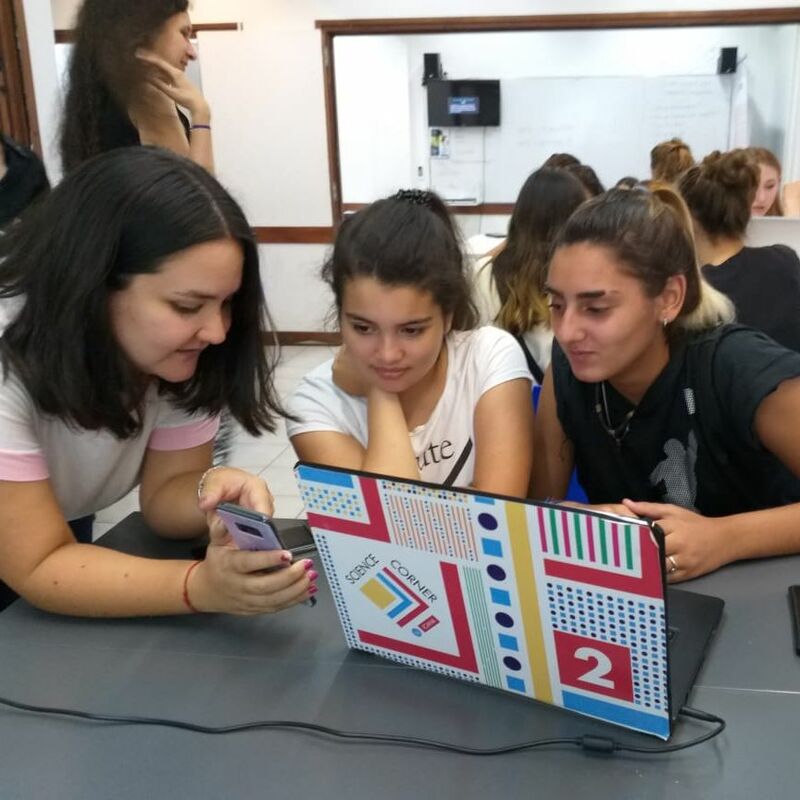 ICANA expects 40 girls to join the program during the first quarter of this year to share their interest in computer science and work on innovative projects with the support of experienced mentors. 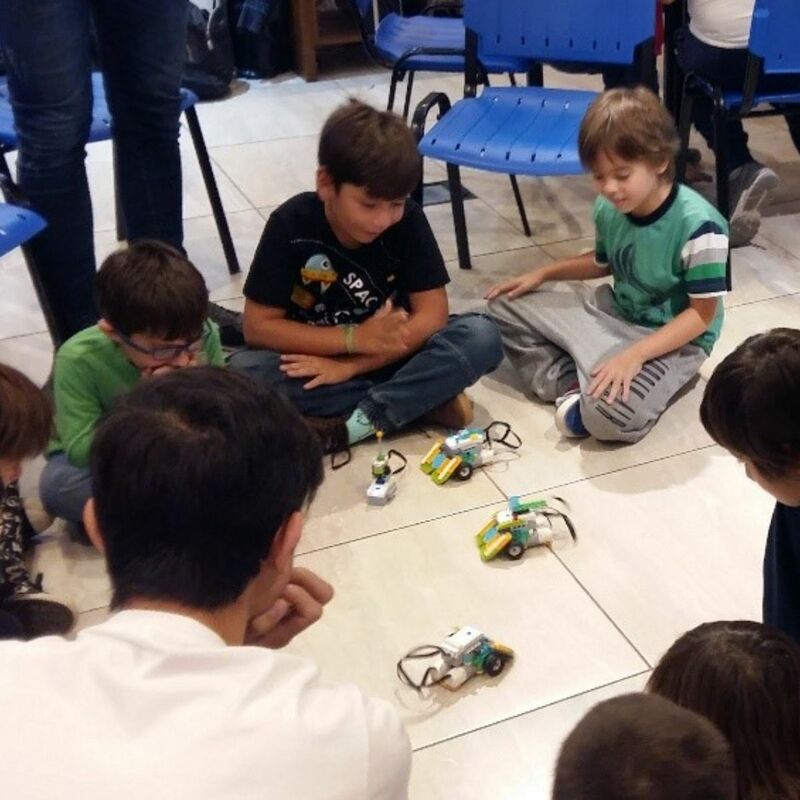 This is a succesful program in its second year of implementation at the Argentine BNCs. 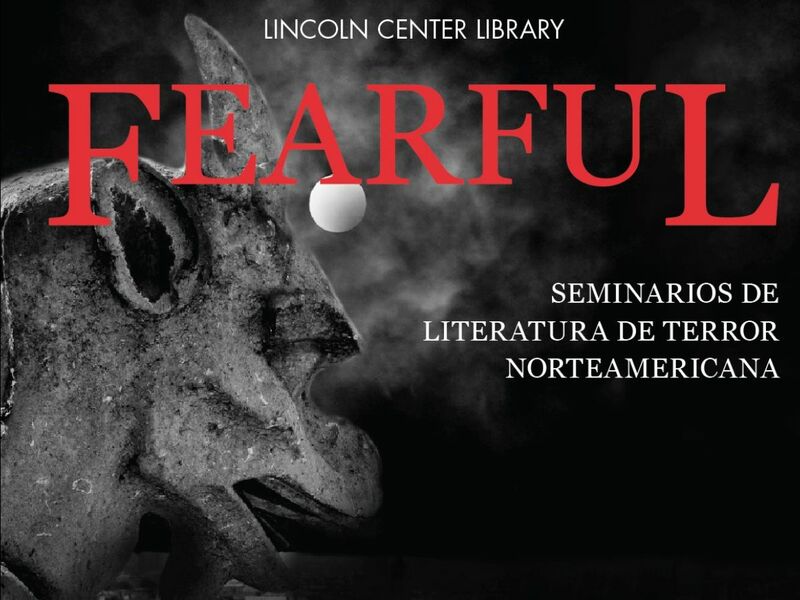 Seminars on horror novels in US Literature: From April through July, ICANA will offer four seminars for students and the community at large, on some well-known American writers of this genre Edgar Allan Poe, H. P. Lovecraft, and Stephen King, distinguished American authors of this genre. The Seminars will be presented byPABLO MARTÍNEZ BURKETT. 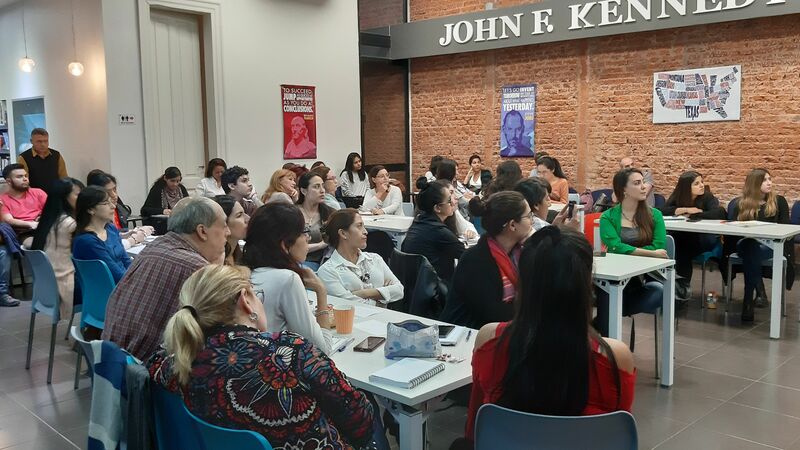 On March 29, ATICANA’s English Language Fellow David Williams offered a workshop to over 80 teachers from the BNC under the title “Give Your Students Fishing Poles: Widening the Information Gap for Language Learners”. Attendees engaged in dialog to widen the information gap on helping students use more cognitive skills for language acquisition. As the event came to an end, several teachers said that they would implement these skills and concepts in their classes and praised David’s practical ideas. 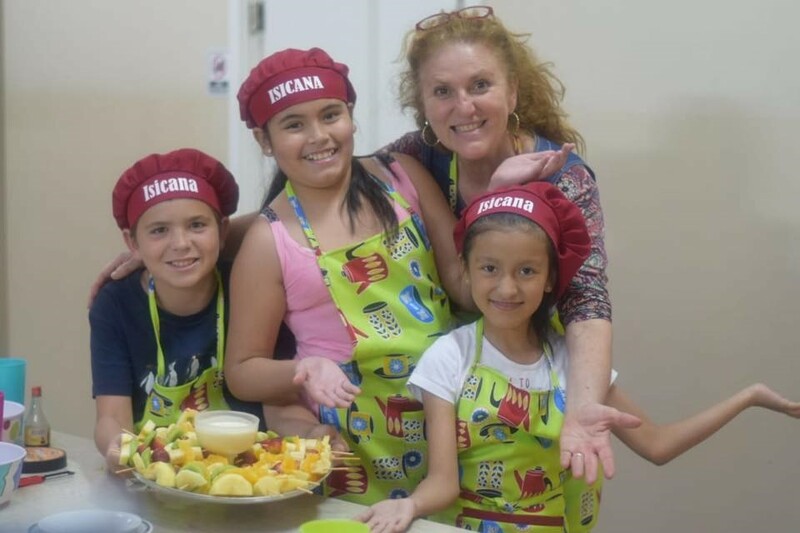 Women’s Day Special: ARICANA invited the local community to their Women’s Day Special. 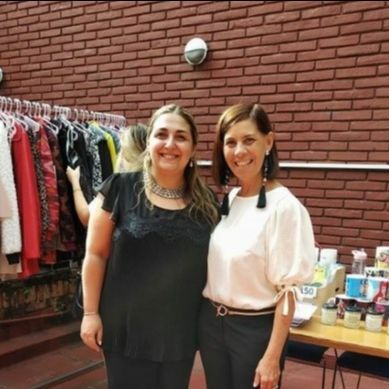 This event, held on March 8th at their headquarters, featured María Cecilia Ribecco (WED Ambassador, Founder of “Emprendedoras CRIAR” and Member of the Executive Board at “Asociación de Emprendedores de Argentina” or ASEA for short) who gave a talk to empower female attendees. She provided the audience with tools, best practices, and helpful mindsets to start and sustain their ventures. Afterwards, Marcela Leguizamón (Founder of Albani Fashion Fabrics) shared her inspiring life story. 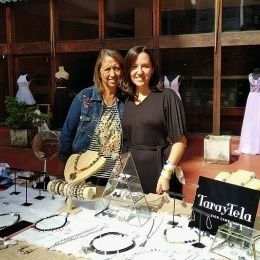 Later, Silvina Arce (Founder of “Coreografía para Mujeres”) performed and encouraged people to dance to classics.Simultaneously, ARICANA offered a showroom featuring multiple local entrepreneurs who displayed their products to the public. Brands that attended are: Albani Fashion Fabrics, Analia Pryga Haute Couture, Lulu Bertò, Mabas Rosario, and TarayTela. Lastly, local singer Aylu Petit entertained the audience with live music. SOL: Stand Out as a Leader Program (first cohort): ARICANA, with the support of the U.S. Embassy in Argentina’s BNCs Leadership Program, presents “Stand Out as a Leader program”, a 3-day-long camp that invites fifteen local youth ages 20-30 to learn how to become a leader and change agent in their local community.The program will feature talks and workshops supervised by ARICANA and organized by professionals in the fields of leadership and social change: Luz Amuchastegui (Director at “El Desafio” Foundation), María Cecilia Ribecco (from “Club de Emprendedores Rosario”), and Juan Ignacio Mandolesi (CEO at Mapplics Mobile Solutions). ARICANA’s staff will also participate and offer talks to attendees. Participants will be asked to develop a Strategic Planning idea/project to help their community or launch a venture that will enrich the local entrepreneurship scene. 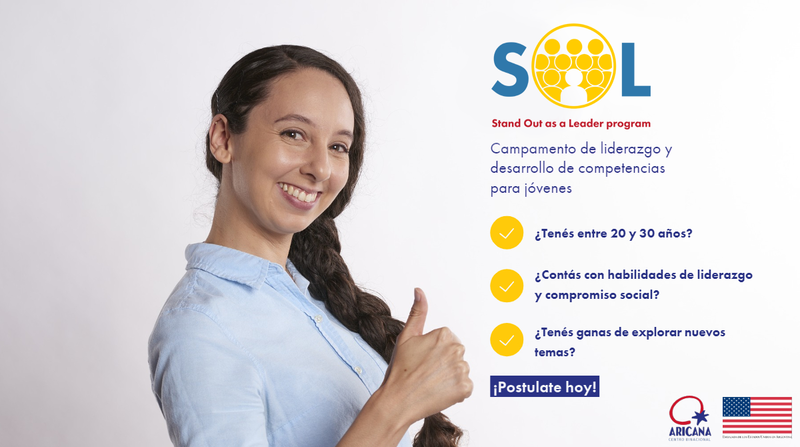 Click HERE to learn more about SOL. 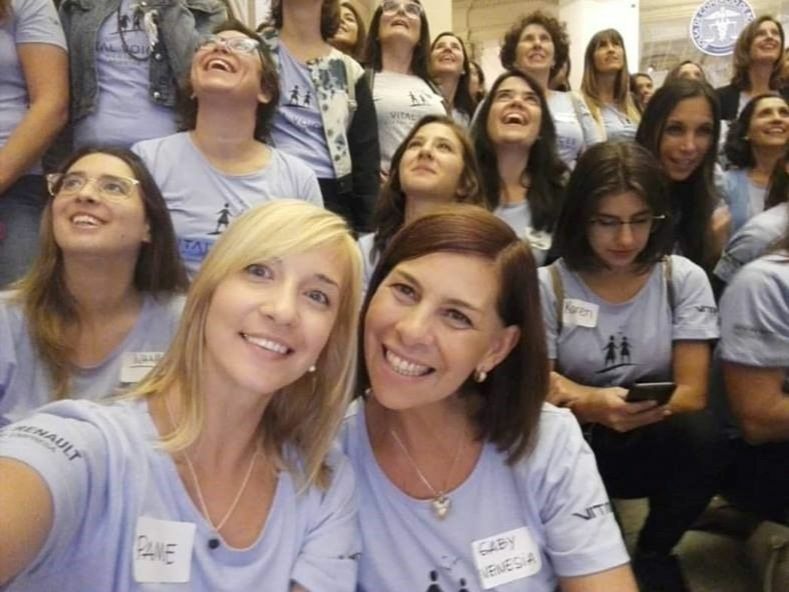 Vital Voices’ Mentoring Walk: Executive Director Gabriela Venesia took part in Vital Voices Argentina’s Mentoring Walk in Rosario. These walks are characterized by having various female mentors who are assigned other women to coach and inspire through sharing their professional and personal challenges. Gabriela was nominated to be one of the mentors. This walk is done yearly in Rosario to commemorate Women’s Day. Click HERE to learn more about this international initiative. Access students Cenizo Ivana, Ferreyra Sabrina and Virginia Ortizwere selected to be part of Ansenuza’s Future Leaders Program. They spent four days participating in the program in which, together with other teens, they learned and immersed themselves in areas such as leadership and various topics linked to women’s empowerment. 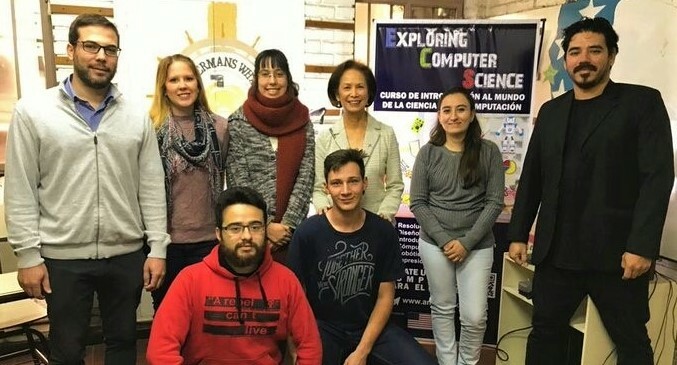 Marina Castellino and DChem David Hacklemen were the student’s mentors.In addition, Access students Florence Bossio and Lucia Martino attended as coordinators of the event held in Miramar, Córdoba. In order to take advantage of what the learned and found fruitful, each one of them will devise a project aimed at benefiting and impacting society positively . Send us your highlights in English related to the 5 Core programs. Include a good quality photo and / or a link to resources. Submissions for next month are due on April 26th.